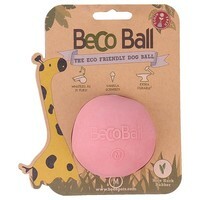 The Beco Ball Pink is an all natural and eco-friendly toy that your pet will love to chase. The ball's unique 'wobbly' design makes it roll around haphazardly and because it is made from solid husk rubber it is incredibly bouncy. This Beco Ball has been made using non-toxic materials so that your dog will not taste anything toxic no matter how much they chew it. The Beco ball has a pleasant vanilla scent.